WEST PALM BEACH — A 12-year-old downtown condo once gutted to replace Chinese drywall, again finds itself subject to repairs, after vibrations from sanding in a vacant apartment set off a fire sprinkler Thursday that sent water cascading through 37 units. Dry-out work continued in 10 units Tuesday afternoon at the Whitney building building at 410 Evernia Street. West Palm Beach Fire Rescue got the call at 4:28 p.m. and shut off off the water at a stairwell standpipe within 15 minutes. They found 20 people evacuated to the lobby, as the fire alarm had gone off; another five people came down after firefighters arrived. The shut-off meant fire watch procedures were instituted throughout building, meaning all residents were notified of the situation, Assistant Fire Chief Brent Bloomfield said. 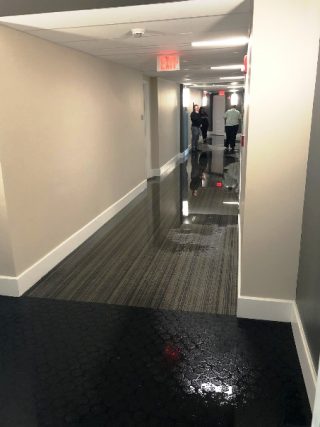 According to Joe Pierman, general manager of the Whitney Condominium Association, staff immediately began sopping up the water and called in a water remediation company after the sprinkler went off in unit 702, on the 7th floor. After several hours, rooms for renters from three of the apartments were located in a Ramada Inn at 1901 Palm Beach Lakes Blvd., owned by developer Jeff Greene, who owns 139 units at the Whitney. The hotel was full but there were cancellations, Greene said Tuesday. Two were staying for two nights, one for one night, Greene said. Josh Myers, who rents the unit next to 702, said after getting bitten by bed bugs at the Ramada, he requested other lodgings but was denied. He used his renters insurance to pay for lodgings elsewhere. Myers said he was allowed to gather belongings but was told he won’t be able to move back in for about five days. He rents his two-bedroom, 1,300-square-foot apartment in the Whitney for $2,300, he said. Water pooled in corridors at the Whitney after one fire sprinkler let loose. No one was injured in the incident but water streaming from the pressurized system left ceilings and walls on the east side of the building sodden and peeling. Hallways looked like lakes. If a sprinkler puts out 75 gallons a minute and it takes 10 minutes to get it turned off, that’s 750 gallons cascading through the building, Bloomfield explained. If there had been a real fire, people would have been happy the sprinkler system worked so well, he said. The building has been through worse. At the time it was under construction in the mid-2000s, American-made drywall was in short supply, sapped by demand from the U.S. building boom and the reconstruction of New Orleans after Hurricane Katrina. Faced with a shortage, many builders imported Chinese drywall. The first Whitney owners took possession of their units in 2007, at the height of the real estate bubble, and real estate values immediately plummeted as recession gripped the nation. Things got worse at the Whitney when the drywall proved laden with sulfur, which quickly corroded copper pipes and wire. Residents couldn’t fathom why their air conditioning units kept breaking down, or why their microwave buttons stopped working. Some even saw their television screens malfunction and their silver jewelry tarnish. The building underwent a major renovation, including new AC units and refrigerators and new patio furniture on a rooftop deck and new lights in the halls.